Videocon's new tablet PC coming soon in India. 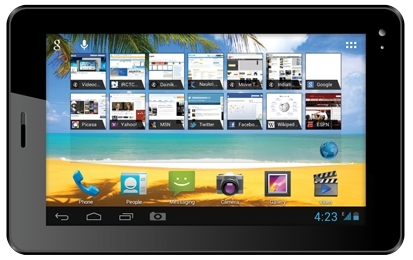 The new tablet named as Videocon VT75C and it now spotted online for sell at Rs. 5,965. It is a Android based tablet with 2G and voice calling facility. Videocon also launched VT71 and VT10 tablets few days ago in Indian market. Videocon VT75C come with 7-inch LCD capacitive touchscreen display with 480 x 800 pixel screen resolution , Multi-touch and automatic orientation detection features. It runs on Google's Android 4.1 (Jelly Bean) operating system and it built in with 1 GHz powerful processor and 512MB of RAM. This tablet sports 4GB of internal storage space, which is expandable up to 32GB using MicroSD card slot. The device packed with dual cameras, 2.0 MP rear facing camera and a 0.3 MP front camera. This tablet features connectivity facility through Wi-Fi, USB 2.0, HDMI, Bluetooth, 3G via Dongle, GPRS, EDGE, and 3.5 mm Audio Jack. For entertainment needs Videocon VT75C loaded with a music player, Full HD Video player, Games and it also pre-loaded with apps such as Movie Studio, Notepad, Facebook, Skype, Saavn, TOI, ET, Google Talk, and YouTube. The device powered by a 3000 mAh Lithium Polymer rechargeable battery. This tablet coming soon in Flipkart and start selling on infibeam for 5,965.